A frighteningly fun game that will make you jump! 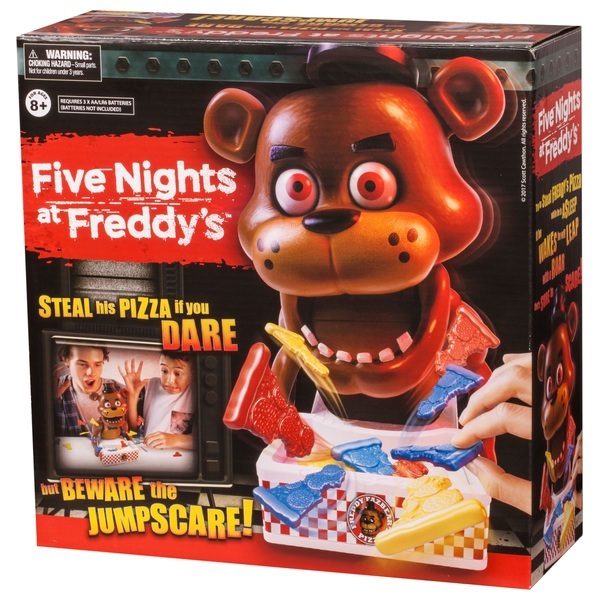 This Five Nights at Freddy's suspense-filled, thrill-seeking game brings the world's most popular jump-scare mobile game to life in 3D form! Players take it in turns to spin the spinnerwheel to determine how many and what colour of pizza tokens they must steal from Freddy's tray as he snoozes. Whenever a player wakes and disturbs Freddy he jumps up and screams at the player eliminating them from the game. Play continues until there's only one player left in the game. Steal his Pizza if you dare but beware the jumpscare!